7615 Colony Rd. #205, Charlotte, NC 28226 • We also speak Spanish and Russian! Gain a beautiful smile without the interruption of traditional braces. Charlotte Progressive Dentistry is an Invisalign dentist and provider. When patients come to us and want to improve their dental health or comfort, sometimes orthodontics is necessary in order to achieve their goals. Many adults, however, shy away from traditional orthodontics because of the bulky and obvious appearance of traditional braces. We want to provide convenience as well as excellent care, so Drs. Camp and Junco opted to offer our patients Invisalign, an innovative way to improve the alignment of your teeth. Similar to traditional braces, Invisalign uses force to gradually move your teeth over time. Gentle pressure will guide your teeth into their ideal position, giving you an improved appearance as well as greater function. Unlike traditional braces, however, Invisalign uses nearly invisible clear aligner trays to put constant pressure on your teeth and move them over a period of months to years. 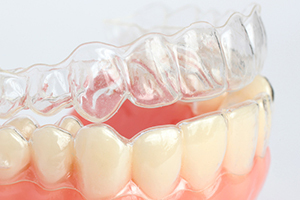 The aligner trays are snug-fitting and clear, so you will be able to speak and smile without anyone noticing them. To get started, we will invite you to our office for an initial evaluation to help us determine if you are a good candidate for Invisalign. We will also discuss your goals for your oral health and appearance so that we give you the look you want as well as comfortable function. We will take impressions of your teeth and send your treatment plan to our trusted dental lab. You will receive a series of clear aligner trays that you will change out periodically – usually about once every two weeks. Each tray set will bring you closer to your ideal smile. During your treatment, we will monitor your progress and make any adjustments necessary to ensure an excellent outcome. When your treatment is complete, you will need to wear a retainer to keep your teeth from drifting toward their original location. 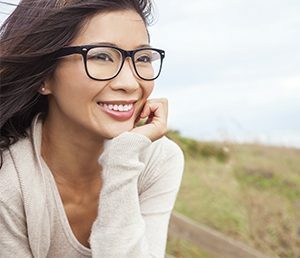 In addition to being discreet, Invisalign also offers many practical benefits. Because Invisalign uses constant low force pressure, you can avoid the periodic, and sometimes uncomfortable, “tightening” that occurs with braces. Since your aligner trays will be smooth, you will not have the damage to the sensitive lining of your cheeks that often occurs with metal and porcelain brackets. Your Invisalign trays are removable. That means you can take them out to brush and floss your teeth. This makes keeping your teeth healthy a breeze and you will not need any special flossers or brushes. You will also not have to worry about breaking a bracket on the foods you love because you remove your Invisalign to eat, as well. You should, however, wear your trays for at least 22 hours per day in order for your treatment to progress regularly. Would You Like a Straight, Beautiful Smile? Contact our Charlotte, NC dental office today and schedule an exam to determine if you could benefit from Invisalign. We look forward to helping you achieve the healthy, comfortable smile you deserve!